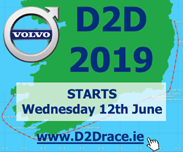 » Volvo D2D 2019 – Entries are now open! NYC > Sailing > Racing > Offshore > Volvo D2D 2019 – Entries are now open! This year, we are particularly delighted to welcome Volvo Cars on-board once again as the race Title Sponsor. Volvo has a great brand affiliation with yacht racing and together we hope to grow the Dun Laoghaire to Dingle Race into a truly premium international event while keeping its Corinthian spirit. We will be working with the local Volvo Car dealer Billy Naughton Limited based in Tralee. In addition we will continue to work with the Dingle Skellig Hotel as our local partner for event accommodation, reception and support.